Enter your College user name (followed by @academic.rrc.ca), enter your password, click Sign in, and then click Outlook. On the left‑hand pane, click More. 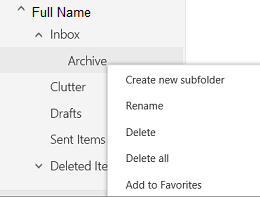 Right‑click on Inbox (or any other folder where you would like to create a subfolder), and then click Create new subfolder. 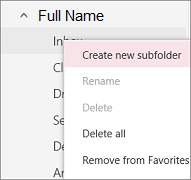 Type a name for the subfolder, and then press Enter. To add the newly created subfolder to your Favorites, right‑click the folder, and then click Add to Favorites. Your new subfolder will appear in your Favorites.